In the NFL logic device, the first SPW (kBias) is launched, followed by the launch of a second SPW (kC2), which steers the first SPW into the left drain terminal for detection, where it’s identified as a logic “1”. Image copyright: De Los Santos. ©2009 IEEE. (PhysOrg.com) -- Computers of the future could be operating not on electrons, but on tiny waves traveling through an electron "fluid," if a new proposal is successful. The new circuit design, recently introduced by Dr. Héctor J. De Los Santos, CTO of NanoMEMS Research, LLC, in Irvine, California, may be a promising candidate to replace CMOS-based circuits, and ultimately continue the circuit density growth described by Moore's Law. As Gordon Moore predicted more than 40 years ago, the number of transistors able to fit on a computer chip has doubled approximately every 18 months. But if the trend is to continue for the years to come, it will have to be with technology other than the conventional CMOS design. As the size of transistors gets down to the nanoscale, CMOS devices begin suffering from several issues, such as increased resistance, decreased channel mobility, and increased manufacturing costs. To overcome the challenges involved with scaling, researchers from around the world have begun to look for alternatives to CMOS technology. De Los Santos’ concept, called nano-electron-fluidic logic (NFL), is based on the flow of plasmons in a fluid-like electron gas (basically an electron fluid). He predicts that logic gates with the NFL design offer the potential for femtosecond switching speeds and sub-femtojoule power dissipations at room temperature - numbers that would be extremely capable of continuing Moore’s Law beyond CMOS. De Los Santos’ paper will be published in a future issue of IEEE Transactions on Nanotechnology. To begin the process, an SPW is launched into a channel filled with electron fluid that forks into two channels, each with a detector at the end. Under no external forces, the SPW will be split equally so that equal portions will be detected at the two end terminals. But when a second SPW is launched into the main channel from the left or right, it will cause the original SPW to deflect into the opposite fork. For example, a second SPW coming from the right would steer the original SPW down the left fork. When the SPW is detected at the left end terminal, and not the right, the NFL device forms the basis of a logic flip-flop, having the ability to store one bit of memory. The SPW design is conceptually different from the CMOS design in the sense that it is based on waves rather than particles. De Los Santos compares the SPW concept to a wave in a pond that occurs when a pebble is dropped in the water. In this analogy, the water is the electron fluid, the disturbance is a departure from charge neutrality at a given point in the electron fluid (rather than the departure from the position of equilibrium of a particle moving up and down), and the disturbance carrying the departure from charge neutrality is the SPW. In comparison, a conventional CMOS logic is based on transporting electrons through a channel by establishing an electron current. As De Los Santos explains, the electron current is made up of an assembly of individual electrons that individually suffer collisions with impurities and the vibrating background semiconductor lattice. These collisions limit the maximum speed, and the minimum power dissipation, attainable to effect a logic function. “So, NFL is fundamentally based on wave (SPW) launching, propagation and manipulation, and CMOS is based on channel conductivity modulation and particle transport,” he said. In the case of the NFL device, the key to optimizing its density is to find an optimal device length for the desired operating frequency. With the resonance limitation in mind, De Los Santos predicts that the ultimate device density would be that of the smallest possible plasmon, which is an electric dipole. Since the smallest electric dipole is an atom, the density would be equal to the areal atomic density of the type of atom used. Compared to current CMOS feature sizes, the NFL logic could potentially perform the same function in just one-fourth the area. In addition to its potential for high density, the NFL logic has other advantages, such as a quick operation speed and a small energy requirement. SPWs have a propagation velocity of about 1 billion cm/sec, which is two orders of magnitude greater than electrons. On the nanoscale, this velocity enables switching times on the order of femtoseconds, or switching frequencies of approximately 6 THz at room temperature. As for energy, the only power required is that needed to excite an SPW, which can be done by any nonzero DC current. Maintaining the electron fluid requires negligible power consumption, so that the device’s overall power consumption is determined by the minimum detectable current. In addition, the NFL concept is compatible with current lithographic capabilities, allowing it to take advantage of established semiconductor manufacturing infrastructure. NFL logic gates could also be interfaced with conventional electronics. In the future, De Los Santos plans to continue investigating the possibilities of NFL logic. More information: Héctor J. De Los Santos. “Theory of Nano-Electron-Fluidic Logic (NFL): A New Digital ‘Electronics’ Concept.” IEEE Transactions on Nanotechnology. To be published. wouldnt something that operated in femtoseconds be on a PetaHertz (PHz) scale we are talking 10 ^ 15 correct? So we are talking about a computer that is roughly 2-3 million times faster than todays machines (2-3 GHz -- 10^9) if femtosecond frequencies could be realized. This is very impressive if it can be readily implemented. I wonder though, if it might not be possible to design the detector part so that resonance could not be achieved? (In terms of the water ripples analogy, something along the lines of a convex stone in the pond that bounces the waves but not back to the origin, or at least not significantly due to the damping effect from the "bounce".) Could this allow even smaller scale components? The reason you can't have the clock speed that high is the same reason you can't reliably push the clock of CMOS units above say 4 GHz. There are other components aside from the CPU that require a slower clock. Sure, the CPU can run at 5-6 GHz, but what's the point if it takes 7 cycles to wait for the operand to be retrieved from memory, instead of a computer with a slower clock doing it in two cycles. Higher clock looks great on paper, but in reality it doesn't do much past a certain point other than waste more power. In this case, however, they can not only shrink the CPU down more, but apply this technology to other areas where optimizations are needed so that one could actually benefit from a higher clock speed. An attractive concept. It is based on the electron wave interference. 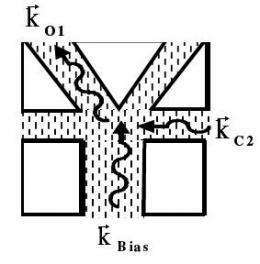 A similar idea on the design of electromagnetic passive gates was published some years ago (G. Kouzaev). The problems which can be encountered are the signal restoration and the isolation of the gate input/outputs. "Just because something is doable, does not mean that it should necessarily be applied." In the case of the new wave resonance processor, any CPU designed aropund the concept would be very prone to deliberate interference from surreptitious outside sources. In fact, it would be a very simple feat to reprogram the CPU remotely, leading to potentially catastrophic results in sensitive applciations. Fascinating concept, but I wouldn't invest in it. I'm led to wonder what kind of photon detection sensitivity one could achieve by monitoring, or even measuring, nanoscale electron fluid disturbances by an absorbed electron. Current detectors rely on the photoelectric effect for a photon to dislodge an electron -- I see potential areas of inquiry where one could measure the passage of a photon nondestructively, or to measure the energy of the photon directly by the degree of disturbance (NF Wave propogation distance) in the electron fluid. This technology appears to open the door to single photon detection and measurement in the visible and infrared domains. Another thought: what are the contributors to noise in this system and what are the sensitivities? Maybe PCM phase change memory will offer speeds able to keep up with the higher clock speeds. Could this principle be used for increase cable/bus transfer speeds, maybe that would be out of range of the wave before it dissipate. The mother board my then limit speeds through tradition electron transfer rates. Fascinating article, I have often thought about organic computers. This could be the first step in that direction. "wouldnt something that operated in femtoseconds be on a PetaHertz (PHz) scale we are talking 10 ^ 15 correct?" Incorrect. Femtosecond period corresponds to Terahertz frequency: 1 fs = 0.001 ns, so we are talking 10 ^ 12, not 10 ^ 15. Have you never heard of an EMP? Modern electronics are vulnerable to tampering by even a small EMP burst. One not need a nuclear bomb to do it, either. A homemade device could be built that can fry all the cell phones in a room. Granted, it wouldn't exactly be portable. But it can be done. I can't see how this technology would be much more vulnerable. surface plasma wave is not accepted terminology. "surface plasmon" is the more rigorous term. SP's (or SPW's) are highly sensitive to the way the metal or dielectric are prepared, since it affects the resulting dielectric constants.